Covered in Colorado-served fresh, powdery snow, the exterior of the expansive, towering structure is flanked by an army of pure white aspens. Its rough-hewn, reclaimed-wood-and-stone walls are dotted with welcoming lights and paned windows with working shutters. While it may appear to be a luxurious, finely crafted yet down-to-earth home from the outside, this building is, in fact, a stunning restored barn and stable with a highly mindful and focused design. 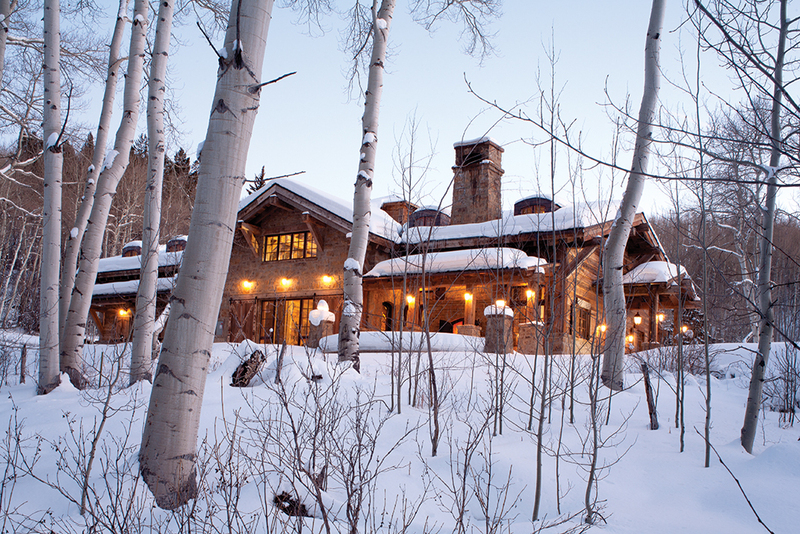 The genesis of this unique structure was a heavy snowfall in 2008 that doomed the original stable of a legacy property in the stunning Rocky Mountain town of Aspen. This weather event, which also claimed a wealth of brand-new ranch equipment, cleared the way for a completely new beginning. “It was an old building and a total collapse — and that really gave us the opportunity to reimagine what the new stable would look like,” says Robert Sinclair, AIA, principal of Robert G. Sinclair Architecture (RGSA), the Aspen-based firm that oversaw the design of the new equestrian stable. The owner of the original stable, which was part of a large, distinctive property with several building sites on it, approached RGSA about constructing a stable that would last for generations to come but, at the same time, appear as though it had already been there for a century. “I gave Rob the freedom to design with the authenticity and attention to detail warranted by the reclaimed materials and traditional assembly methods …as if it had been there for generations. He achieved a functionally beautiful stable for our prized horses, with all of the character and charm that I was hoping for,” says the property owner, who prefers to remain anonymous. The result is an impressive blending of the old with the new. Inside the stable structure, soaring ceilings are punctuated by sunlight-drenched skylights, beautiful handwork appears on everything from railings to doors, and painstaking details like brass-colored lighting fixtures and paned windows heighten the entire effect. 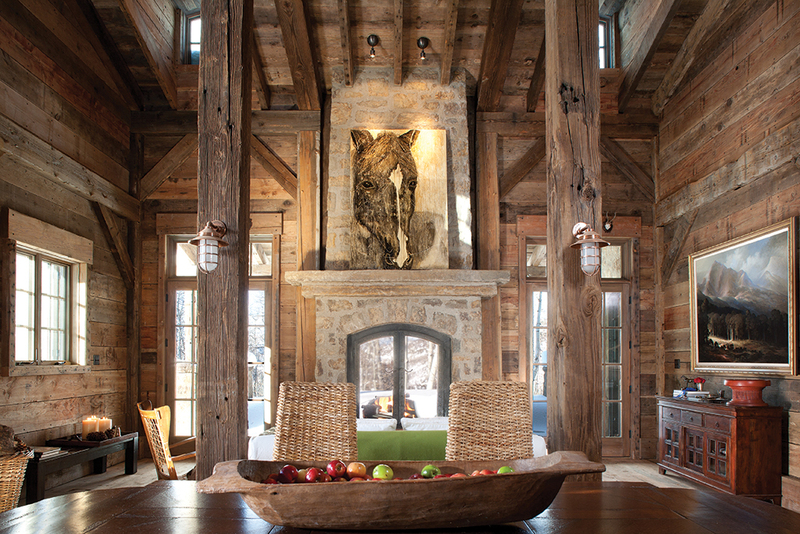 To achieve the proper vintage look, the architect designed a true timber frame structure, complete with authentic detailing, historically accurate assembly methods and reclaimed materials. The finished structure is divided into three equally standout zones, all heated by radiant modular heating. The first zone is a shop built of reclaimed, hand-hewn oak, with a loft above crowned by an opaque skylight. The second, built of reclaimed fir, features six 12-foot module-type stalls, two wash stalls, and a foaling stall, with a hayloft above. 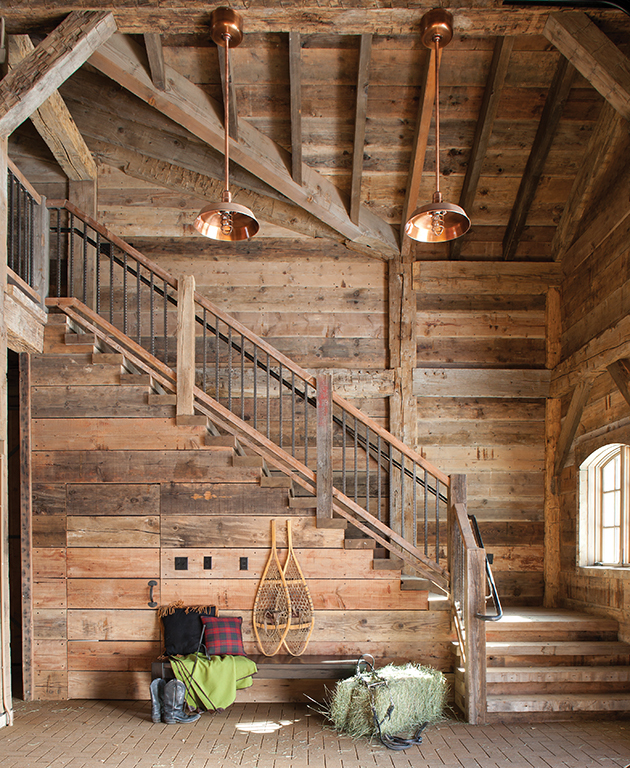 The third is a two-story tack room, also crafted out of fir. It boasts an impressively scaled, double-sided fireplace with a one-piece stone mantel. 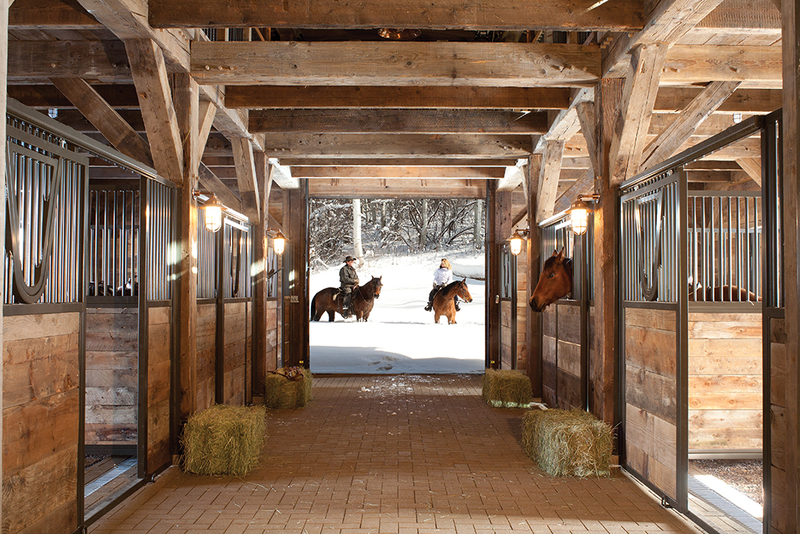 Even outside, the design of this equestrian stable is in perfect alignment with the old-meets-new ethos. Just outside the barn doors lies a round pen and paddocks that flank the structure’s stone-clad exterior, which is graduated in size from top to bottom. Soaring ceilings punctuated by sunlight-drenched skylights and brass-colored lighting fixtures brighten the structure’s heavy woods and stone. From start to finish, this unique architectural project spanned a full 2 1/2 years. And, the end result is a perfectly successful marriage between the old and the new. The owner’s — and the architectural firm’s — original goal was fully realized.